When your dentist installs your dental implant, the metal part that serves as a base for the crown is known as an abutment. It serves solely as a connector with one part attached to your jawbone, while the crown is fitted on the other end. If you're wondering what a crown is, that is the part that looks like your natural teeth. People commonly refer to them as caps. Abutments are typically made out of titanium, but other materials like zirconia and gold are sometimes used. Zirconia, in particular, is becoming increasingly popular since it's has a similar color to your natural teeth. That makes it less visible inside your mouth than titanium. Abutments can also be used to facilitate gum tissue regeneration. These types are also known as healing cuffs. Healing abutments are fitted over a dental implant, and the larger width of the healing cuffs helps to make space for the crown. Your dentist has two options when it comes to successfully attaching a dental implant into your jawbone. Gum tissue can be used to cover up the abutments, and it's given about six months to heal. Your dentist will then cut the gums open to expose it, making way for the crown to be fitted. The second option would be to attach a healing abutment. As discussed above, the healing cuff is attached to the external end of the implant. It's a lot wider than the implant, and it ensures there is enough room for the crown while the gums heal around the implant. Patients often prefer the use of a healing cuff since this eliminates the need for more surgery. After the implant is fully fused to your jawbone, the healing cuff is removed and a crown is fitted on the dental implant. Your gums might need to be reshaped since the space created by the healing cuff doesn't always match the size of your crown. Abutments are placed above your gums while implants are placed below. That leads some to forgo healing implants because they do not want to have the abutment poking out of their gum while waiting for the implant to bond with the jaw. Healing cuffs eliminate the need for multiple surgeries. Without these, your dentist would have to reopen your gums after the implant has fused to your jawbone so that the crown can be attached. With the healing abutment, all that needs to be done is some reshaping of the gum area around the crown to ensure a natural fit. Crowns are dental prosthetics that look like your natural teeth. It is attached to your implant via an abutment. Dental cement is used to keep the crown firmly secured in place. 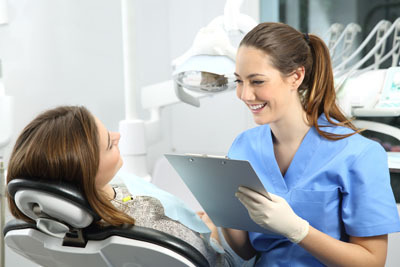 Once the implant has been installed, connecting the crown to it is a relatively quick process. So…Want to know more about abutments? For more information or to schedule an appointment with Dr. Call Dental Center,request an appointment in our Dalton dental office here: https://drcalldental.com. Or call us at (706) 425-6240. « How is A Dental Bridge Attached?